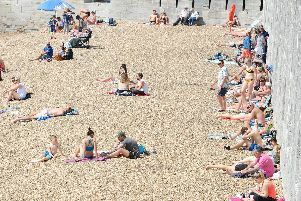 A heatwave warning has been issued for Portsmouth as the warm weather continues. The Met Office has issued a Heat Health Watch Level 3 warning for South East England. In the UK there is no official definition of a heatwave but the term can be used to describe an extended period of hot weather relative to the expected conditions of the area at that time of year. The Heat Health Watch service has four levels of warnings for when heatwave conditions are being experienced in a region. A Level 3 warning means that the thresholds for a heatwave have been exceeded. The Met Office has warned that there is a 90 per cent probability of heatwave conditions between 9am today and 9pm tomorrow.